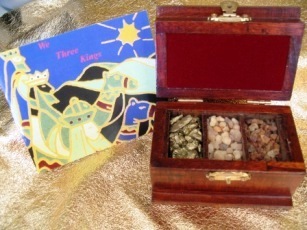 Gold, Frankincense and Myrrh gift chests bring the Gifts of the Magi to life. These “Original Gifts of Christmas” are real. Real 23 karat gold and authentic frankincense and myrrh from the same regions as the gifts brought to the baby Jesus on that very first Christmas. 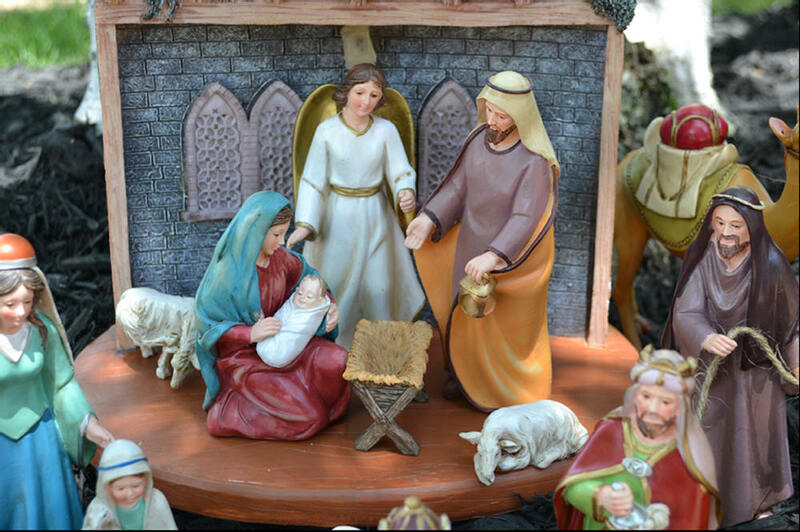 The Christmas collectibles will be at home along side your Nativity set and will become a tradition that bring years of joy. 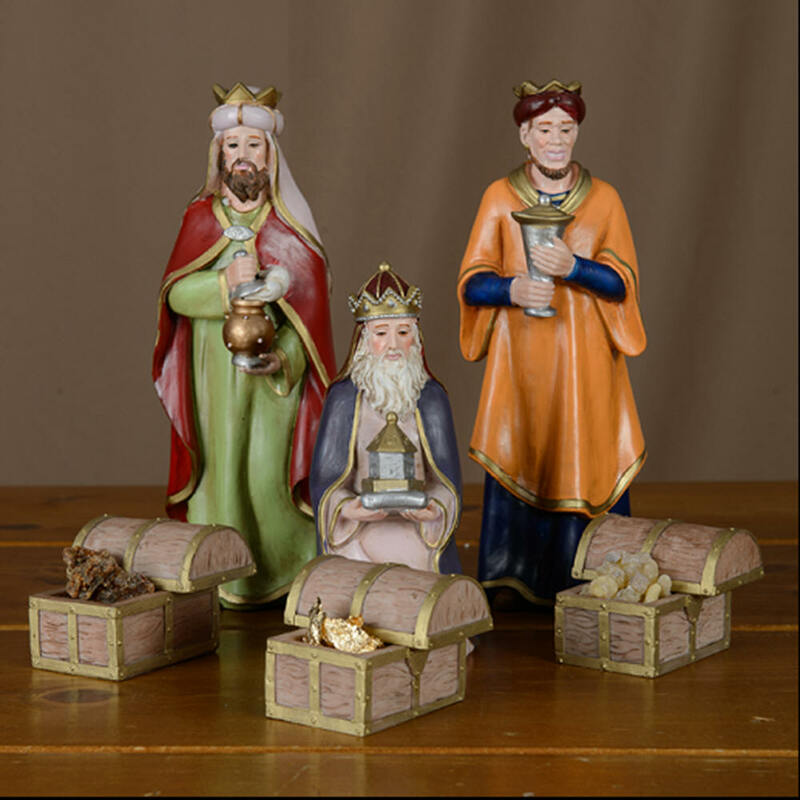 The satin lined wooden chests capture the regal spirit of the gifts given by the 3 Kings, Melchior, Balthasar and Gaspar, and remind us why we give gifts on Christmas Day, the Epiphany or the Dia de los Tres Reyes. Each item comes in a attractive gift box with a gold foil stamp with the silhouette of the Three Kings following the Christmas Star. A perfect reminder of the real reason for the Christmas season! The gift boxes are packed with burgundy tissue to protect the gift and add a richness to the packaging. All items include a Story Card explaining the history and Certificate of Authenticity. 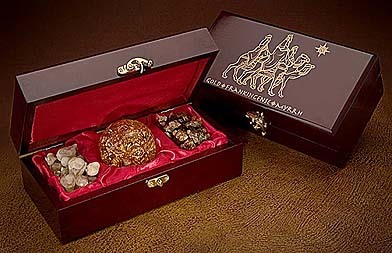 Includes a bottle of Gold (not Ball shown), Frankincense, and Myrrh in one combined wood box display. Includes story card and Certificate of Authenticity. The silhouette of the Magi following the Christmas star – printed in gold – adorns the lid of this rich looking box. The box measures 6.75" x 3.75" x 2.5". The dark stained-high gloss finish is offset by the unique brass latch. The interior of the box is striking with its luxurious red satin lining on both the padded lid and base. The large tears of frankincense, a glass bottle of gold and crystals of Arabian myrrh are nestled together in this beautiful collection of the Gifts of the Three Kings. Each King’s box opens to display the REAL gifts! 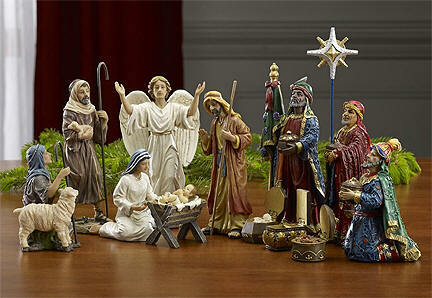 11 piece set with REAL gifts of Gold, Frankincense and Myrrh from the Three Wisemen! 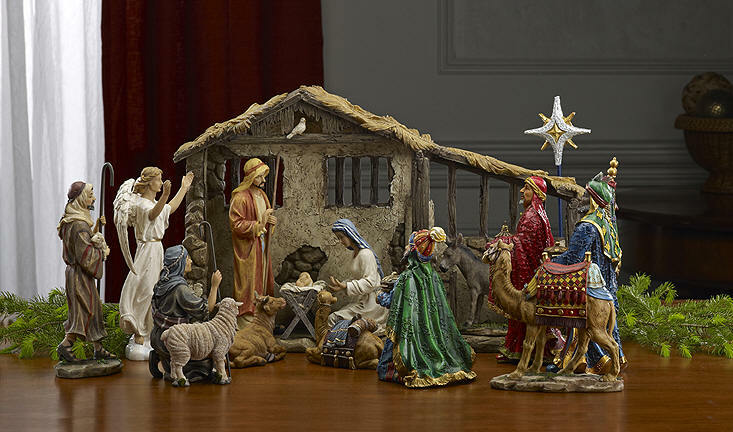 The dramatic, life-like realism and true elements like real gold, frankincense and myrrh make an heirloom that will be a source of meaningful joy for many years. figures sold separately BEST SELLER! 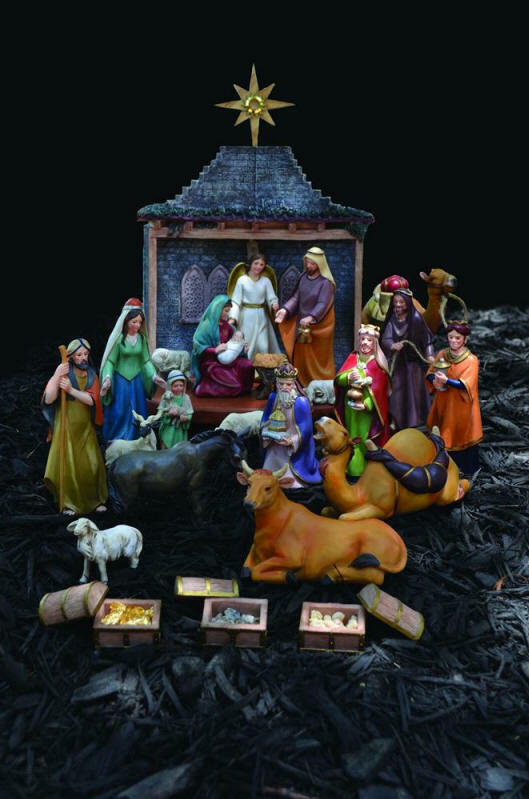 Complete 26 piece Bethlehem Nativity Set with Genuine Gold, Frankincense & Myrrh + BONUS Star Program! 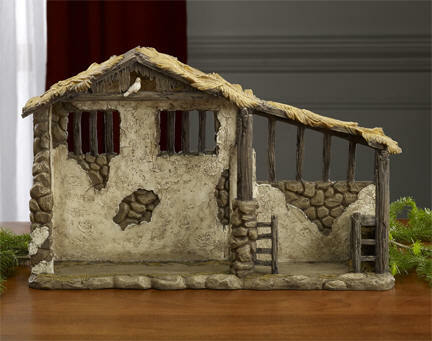 From the vibrant hues to the exquisite detail, every piece of the Bethlehem Nativity Set elicits a resounding "Alleluia!" Southern artist, Almajohn, brings each piece to life with her masterful touch of color. 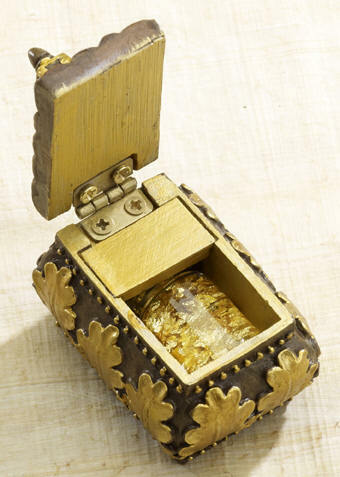 The wisemen bring gifts in chests filled with 24kt gold leaf, authentic frankincense and myrrh. The top of the stable is the perfect place for a star, and if you register your set online or by mail with the set’s producer, you will receive a new one yearly until you have 3 unique stars. 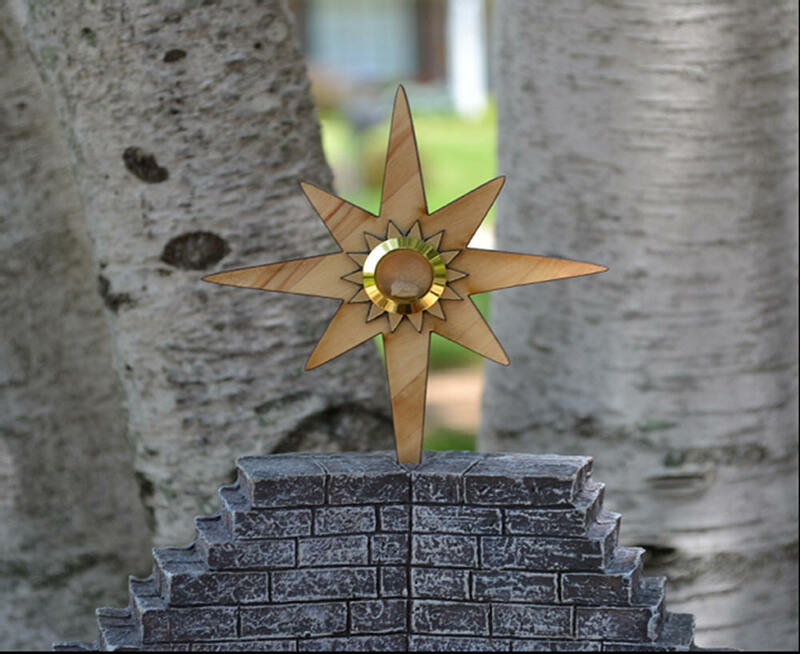 The initial star, which you will receive with your purchase, is crafted from genuine olive wood with a Nativity rock centered on the star. Each rock comes from the garden just 5 feet away from the famed Nativity Church, located in the spot where scholars believe Jesus was born. 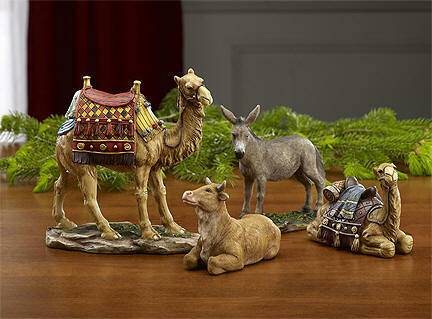 Destined to be a treasured family heirloom, this Nativity set will create traditions of its own for you and your family to enjoy year after year. 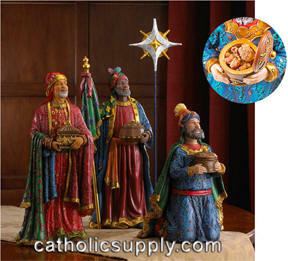 These richly colored figures of Melchior, Balthasar, and Caspar bring the The Kings to life like never before. 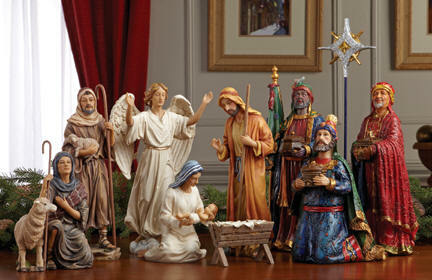 The figures are regally adorned in bright colors and dramatic detail. Designed to set apart from a nativity set, these figures show the Magi as they gaze toward the Christmas Star on their journey to Bethlehem. 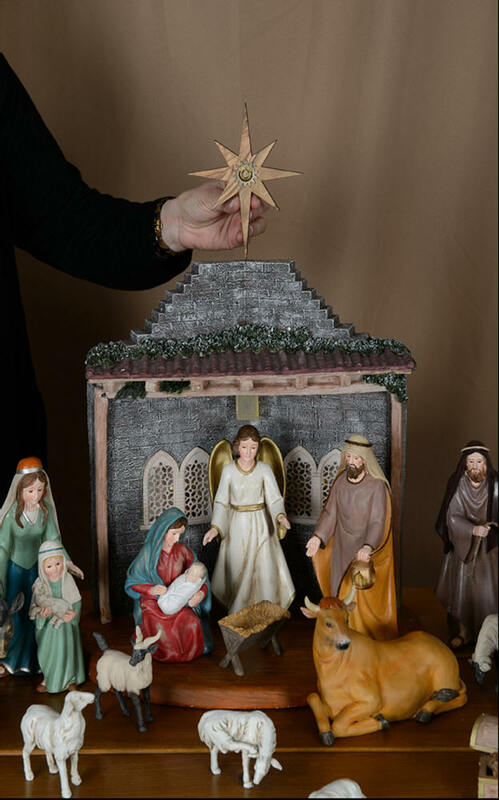 Each of the life-like figures carries a chest that opens to reveal the Original Gifts of Christmas- real Gold, Frankincense and Myrrh. Available in 2 sizes! Set includes one Gold Ball in Chest, one Frankincense in Chest, and one Myrrh in Chest. Includes story card and Certificate of Authenticity. Individually Gift Boxed. 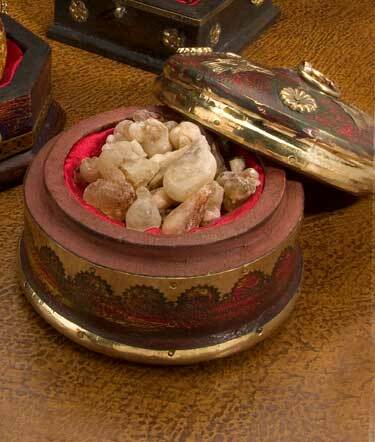 Frankincense was the Gift given by Balthasar, a king from Saba - present day southern Yemen. Frankincese is resin from the dried sap of the Boswellia tree – a tree that has grown on the craggy slopes of the Arabian Sea for thousandd of years. In ancient times, Frankincense and Gold were equally valuable. Frankincense is harvested by making slits in the bark of the tree and letting the resin slowly bleed out and harden into white “tears”of Frankincense. 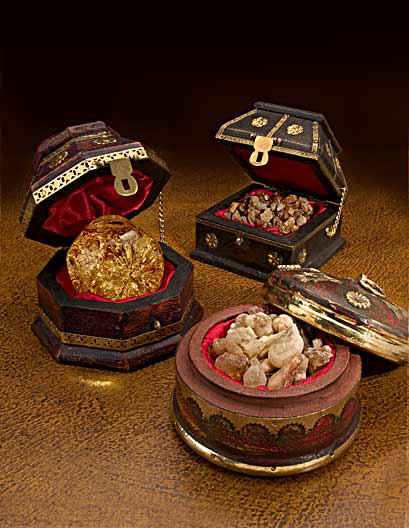 The primary use of Frankincense is the same today as it was in ancient times: it is a very strong incense with a sweet aroma that is used today in religious services. 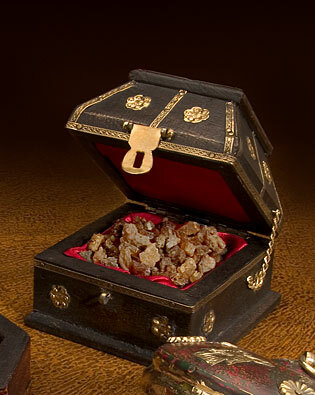 The Frankincense here is from the very same region – Oman and Yemen – as the original gifts given by Balthasar. Our Frankincense is selected from the highest grade in an effort to capture the spirit of the actual gifts given 2000 years ago on that first Christmas. Includes story card and Certificate of Authenticity. Gift Boxed. Myrrh – the Gift given by Gaspar, a king from Tarsus – present day Southern Turkey. 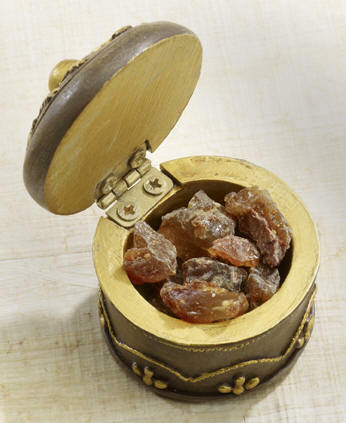 At the time of Christ, the world’s finest Myrrh came from Southern Arabia and it is generally thought that this was the origins of Gaspar’s gift. The Myrrh supplied with the Three Kings Gifts displays is the finest available from Southern Arabia – the very same region as the original gifts given by Gaspar – in an effort to capture, as best as possible, the spirit of the actual gifts given 2000 years ago on that first Christmas. Myrrh is resin from the Cammiphora tree and is harvested by cutting slits in the bark of the tree from which Myrrh resin hardens into dark red crystals. In ancient times, Myrrh was among the most valuable substances known and, at the time of the birth of Christ, it was worth seven times its weight in gold. It can be used as an incense or it can be ground into a powder and mixed with oils to make a balm or processed into an oil. In ancient times, myrrh was used in the mummification of the Pharos in Ancient Egypt and to anoint kings. It also continues to be used today as it has for centuries as a natural dentifrice and is used in toothpaste and other oral hygiene products. We hope you enjoy your gift for years to come. 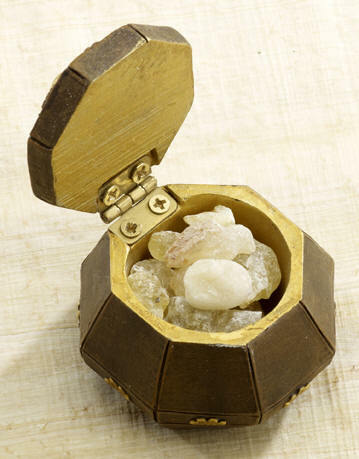 When storing, put the frankincense and myrrh in their storage pouches. The resin may change color due to humidity and temperature changes. This is a natural characteristic. Keep the gold dry. Changes in temperature may cause condensation to form on the outer surface of the gold ball. 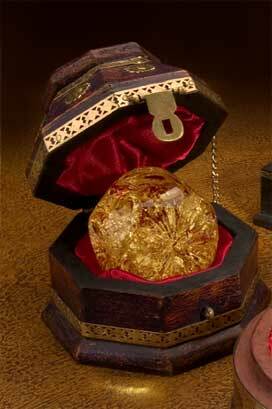 The liquid inside the gold ball is non-toxic and won't stain fabric but should be washed if exposed to skin. DO NOT EXPOSE GOLD BALL/BOTTLE TO EXCESSIVE HEAT OR OPEN FLAME. 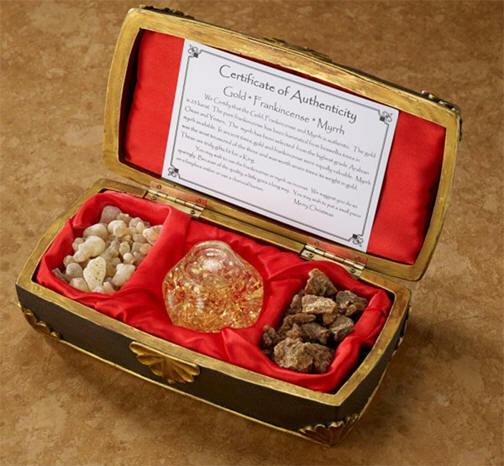 The frankincense and myrrh are all natural and non-toxic, but not intended for consumption. Do not keep in the reach of small children or pets.